Hotspot Shield Review 2019 - Is Hotspot Shield Safe? Hotspot Shield review 2019 – Is Hotspot Shield safe? Hotspot Shield is a product of AnchorFree, a Switzerland-based company. Its website boasts the popular free version of its software has been downloaded 600 million times. However, its paid Elite version has some claims of its own. It’s renown for some fast speeds, but has recently run into some bad press around its data policies, and has even been reported to the Federal Trade Commission (FTC) . As such, potential users are no doubt eager to learn how it compares to other providers. We gave Hotspot Shield a whirl to see how it stacks up against our top rated providers like NordVPN and ExpressVPN. In this review we’ll explain what you can expect when you sign up for an account, including pricing, features, privacy, and performance. Let’s get started! Hotspot Shield has a free product that it pushes more than most VPN providers when it comes to similar no-cost offerings. This makes sense when you consider that a large part of the company’s revenue comes from ads shown to users of the free service. Although it’s not promoted heavily on the website, you can find the Elite version in the Pricing tab, and this is the one we’ve been testing out. Up to five devices can be connected simultaneously. Pricing for this plan is $12.99 (GBP £9.83) per month if you pay one month at a time. You can sign up for six months to get a large discount at $8.99 (GBP £6.80), or 12 months for $5.99 (GBP £4.53) per month. There is also a lifetime option priced at $119.99 (GBP £90.80) which works out to be roughly the same as paying for two years up front. Somewhat confusingly, on a different pricing page, there’s a two year option priced at $2.99 (GBP £2.21) per month. Overall, pricing is a little above average, although the two-year deal is great. All plans do come with a 45-day money-back guarantee, which is very generous given most providers extend guarantees to 30 days or less. Payment can be made by credit card, debit card, or PayPal. The lack of bitcoin or other cryptocurrency payment options may be disappointing for some users looking for an additional layer of privacy. One more additional option you’ll get when you go to sign up for the service is the ‘Speed Boost’ feature. This add-on is priced according to your payment term and offers access to dedicated servers. These reportedly have less traffic and access to more IP ranges, and in theory should help in unblocking streaming services like Netflix and BBC iPlayer (more on that below). With other providers offering optimized servers and access to Netflix with their basic plans, this add-on seems to be a bit of a waste. However, Hotspot Shield is currently adding it on for free for some users who contact the support team. Apps are available for Windows, MacOS, iOS, and Android. Users of the free version can, by default, only connect to the US server. However, if you want to access certain popular streaming sites, like Netflix, you’ll be greeted with an Elite plan payment wall. What’s more, bandwidth is capped at 500MB per day and the apps show ads from Hotspot Shield’s partners. A welcome feature from this provider is malware protection, but free users are only protected from known malware sites. The Elite version offers access to 2,500 servers covering 25 countries, including Japan, Hong Kong, and many European locations. Bandwidth is unlimited which is good news for torrenters, and users can enjoy an ad-free experience. You’ll also get enhanced malware protection against infected, phishing, and spam sites. 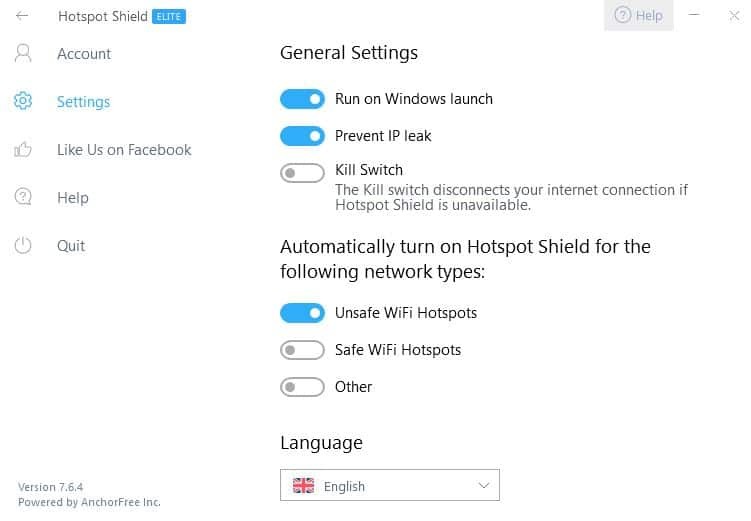 Security features worth noting here are Hotspot Shield’s optional IP leak protection and built-in kill switch. The kill switch will ensure that your internet is immediately disconnected in case the VPN connection is lost for some reason. This acts as an additional layer of privacy to prevent your data being leaked. 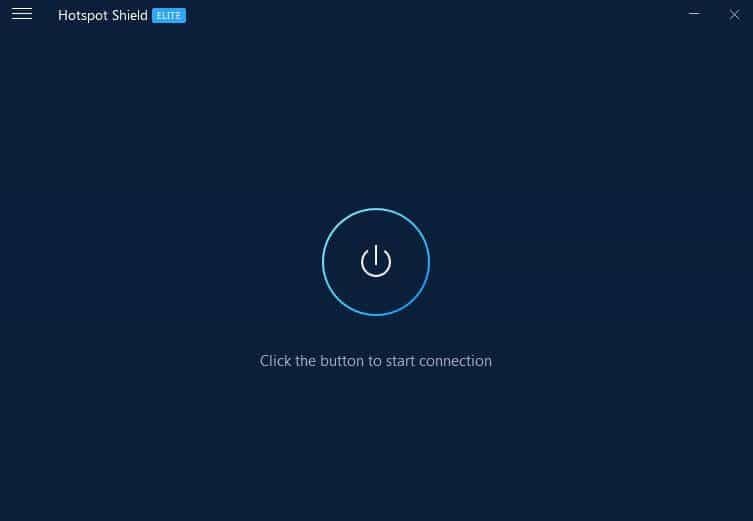 Getting started with Hotspot Shield Elite can be done in two ways. You can pay via the website, in which case you’ll submit payment through PayPal or another third-party payment platform. Note that you’re not asked to submit any other personal information. However, if you’d like to use this paid account across multiple devices, you’ll need to provide an email address and create a password. The other option, if you’re only using Hotspot Shield with a mobile device, is to pay through the app. In this case, payment will be through Google or Apple. This is not a common option among VPN providers and may be welcome news to some users looking for convenience and limiting the number of parties they provide their email address to. For the purposes of this review, we used Hotspot Shield with Windows and iOS. Once the desktop app is downloaded and you’re signed in, you’ll be greeted with a main screen simply housing a power button. Once you’ve hit the button to start the connection, you’ll view details of the connection including duration, country, and data usage. Note that you’ll be connected to a US server by default. Unlike some other VPNs, you don’t have to disconnect before switching servers. Simply use the country dropdown to select your new location and it will connect for you. Note that closing the app will not drop the connection and it will continue to run while sitting in the system tray. Back to the menu options, the only noteworthy area here is the Settings tab. Here you can adjust automatic launch settings, disable IP leak protection, and enable the kill switch. At the bottom of this screen, there’s a pretty impressive list of language options, including Turkish and Japanese. And that’s pretty much it for the desktop app. Other menu items include links to Facebook and the Help Center but nothing more in the way of actual options. This is likely welcome news for beginners looking for ease of use, but advanced users may be missing some extras. Once you’ve downloaded and run the iOS app, you’ll be presented with a popup for a seven-day trial offer for the Premium (Elite) version. Note that accepting this will prompt you to enter your Apple password (for iOS users) to approve payment. You won’t pay anything upfront, but once the seven-day trial is over, payments will automatically kick-in. If you want to test the free version, or have already paid for an account, you can simply close the popup by clicking x in the top right corner. However, you’re then greeted with a sales pitch for the same 7-day trial of the Premium version. This feels like slight overkill, especially when some people accessing the app will have already paid online. What’s more, figuring out how to get off this screen actually took a couple of minutes, as the x is located at the bottom of the page, which is several screen-lengths long. Nevertheless, once you’re out of that, you’ll arrive at the main screen which is similar to that of the desktop version. You can log in via the My Account tab in the menu. Now you’re greeted with an FAQ section, explaining some of the privacy aspects of using Hotspot Shield. Once you click out of this, you’ll be prompted to agree to allow the provider to add VPN configurations. Then, you’ll finally arrive back at the main screen where you can view your connection duration and location. Again, by default you’ll be connected to a US server and can change the server location using the country dropdown. Click on the menu icon to access account details, privacy policies, and the help center. Hotspot Shield maintains a relatively large network of 2,500 servers, although these only cover 25 countries. The setup of the app means that you can only choose which country you want to connect to, not a specific city. With other providers offering multiple choices for some countries, particularly the US, some users may miss the more extensive location options. In spite of the network of servers being relatively small, the overall performance was solid. Switching between servers is quick and simple and you don’t have to manually disconnect to make a change. Additionally, connecting to most servers didn’t have any noticeable effect on the overall speed. However, we did experience a sometimes slow connection while connected to one of the test servers in Canada (more on that below). In spite of this, we were still able to play online games without any issues and stream 1080p with no buffering while connected to this server. We were able to do the same with our other test servers in the US and the UK. When we perform our speed tests, we want to be as empirical as possible. For each test, we downloaded the same file (~100MB in size) from a server in Oregon. We repeated the tests at three different times throughout the day, alongside another VPN provider, PureVPN. In addition to testing speeds when connected to various servers, we ran a control test at each time point without the use of a VPN. We conducted the tests in Toronto, Canada, using three sample VPN servers in the US, Canada, and the UK. We typically try to test servers in the US West and US East. However, Hotspot Shield has only one option for the US as a whole, so we decided to test in Canada as well. The provider could not disclose more specific information about the locations of the US and Canadian servers. An IP check indicated that we are using a server in the US West but it was inconclusive for the Canadian server. As such, for Canada, the general distances from the test server to the test location and the server that houses the test file are both unknown. The results we got are interesting compared with those we’ve seen from other providers. 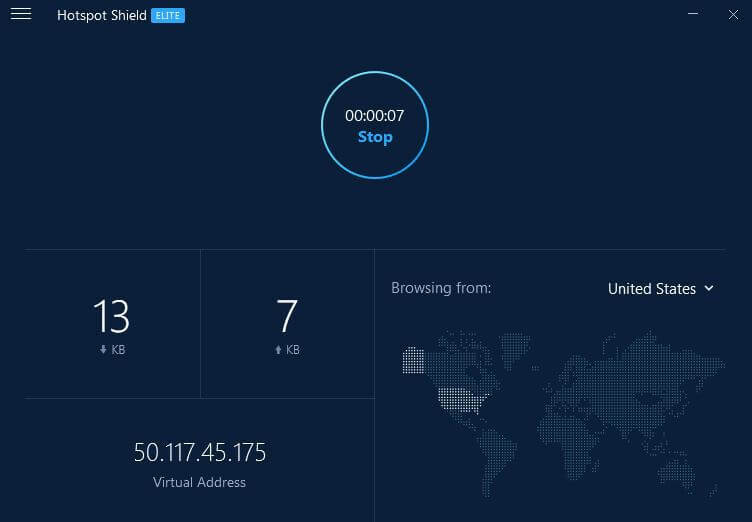 Hotspot Shield is known for its fast speeds, and indeed we saw plenty of evidence of that. The tests for the US and UK servers consistently resulted in blazing fast speeds. We don’t typically see results that are faster than the control, and these speeds were sometimes twice as fast or even better. On the other hand, the Canadian server delivered drastically different results. While it performed comparably to the other servers during an evening test, the morning and afternoon test saw painfully slow download speeds. It’s a shame since, given the other fantastic results, you’d hope to see consistency across servers. We contacted Hotspot Shield for a possible explanation but we only received a generic troubleshooting response. Hotspot Shield unblocks some Netflix libraries. When we’ve tested Hotspot Shield with Netflix in the past, we had great success accessing multiple libraries. However, with Netflix cracking down on VPN usage, Hotspot Shield isn’t currently able to keep up. We tested Netflix using servers in various locations, with less than stellar results. While connected to servers in the US, the UK, and Canada, Netflix didn’t work. However, we were able to access France and Germany libraries, so you might want to try your luck with your desired location and see if it works. We contacted customer support and an agent tried to help by offering us the Speed Boost upgrade for free. However, this didn’t have an impact on our Netflix testing. This is an ongoing problem for VPN providers and many are having a tough time providing access. We were unable to access other streaming sites we tested, including Amazon Prime and BBC iPlayer. With China’s Great Firewall in full effect, many providers are having issues maintaining connections within the country. A Hotspot Shield representative acknowledges this is an ongoing issue and the VPN is blocked at times, but usually works. “Will using Hotspot Shield stop advertisers from collecting any information about me or my device? 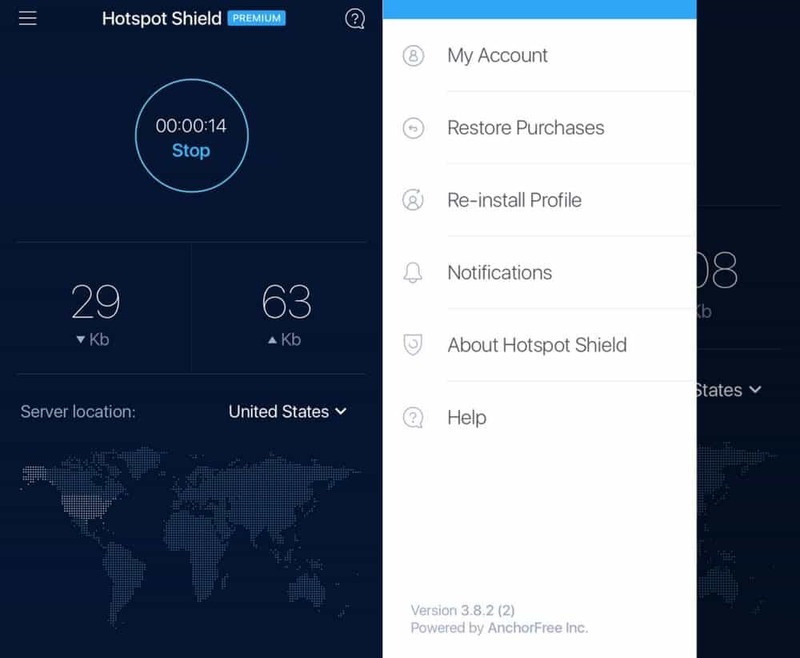 As mentioned, you can use the free version of Hotspot Shield without handing over any details at all. Of course, your IP will be still be exposed. To use the Elite version you’ll need to provide payment info to a third party. You can pay on the website or through the app as discussed earlier. When it comes to security, Hotspot Shield uses 128-bit encryption with ECDHE for perfect forward secrecy, signed with 2,048-bit RSA keys for authentication. While many providers go for 256-bit encryption and 4,096 RSA keys, 128-bit with 2,048 bit keys is still considered very secure. Instead of opting for an existing VPN protocol – we’re fans of OpenVPN – Hotspot Shield uses a proprietary protocol called Hydra. It’s tough to say whether or not this is a good thing but with solid options like OpenVPN available, we’d like to hope that Hydra performs as well, if not better. Hydra uses ‘multi-hop’ connections to route data to several possible gateways, meaning increased data security for the user. The company doesn’t disclose whether it uses its own or private DNS servers. However, on all the servers we tested, there were no signs of DNS leaks, which is great. It also comes with IPv6 and WebRTC leak protection. These are enabled by default but can be turned off should you wish by going to Settings and turning off Prevent IP leak. Hotspot Shield also comes with a built-in kill switch so the internet connection will drop immediately if for some reason the VPN connection is lost. If you’re in need of a little help, you have a couple of options. On the website, clicking the Help tab will take you to the Hotspot Shield Help Center. Here you’ll find articles on a range of topics, including getting started with each device, payment, and general troubleshooting. If you can’t find what you’re looking for there, you have the option to contact AnchorFree Support through live chat powered by Zendesk. Note that this only seems to be available on the pricing page. While convenient, the outsourcing of customer service might not be welcomed by users looking for more privacy. You can alternatively submit a ticket to receive an email response. Our ticket was responded to within around 16 hours, which isn’t bad considering there is a live chat option available. While it’s a little on the higher end in terms of price, Hotspot Shield is not unaffordable and has plenty to offer. It’s easy to use and if you choose the right servers, then you’re in for a treat when it comes to speed. It has some desirable security features, including strong encryption and a built-in kill switch.